I had a certain feeling of deja vu this afternoon as the rain poured down on our first day of the series. We experienced such weather during our April series. There is something so conducive to a rainy day restorative practice. So welcome all to your post-game wrapup (it is football season!). This blog is your “Go To” place for the poses, the breath, meditations, journal questions and much much more. Stay awhile, browse and visit often. Check out a recent video of Jillian Pransky in a previous posting. The diaphragm is the primary engine of the breath. As we inhale, this domelike muscle descends toward the abdomen, displacing the abdominal muscles and gently swelling the belly. As we exhale, the diaphragm releases back toward the heart, enabling the belly to release toward the spine. This breath can be done either lying down, seated or standing. Place one or both hands at your belly, inhale slowly and deeply either through the nose or through pursed lips and send that breath down into the deeper part of the belly. The abdomen will inflate like a balloon with the inhale, and deflate with the exhale. You will feel the belly swell against the palms of the hand. Very calming breath for your nervous system and may also increase the amount of oxygen you get into your body. Begin with a few breaths and continue to increase. As in any breath, if you begin to feel dizzy or lightheaded, stop. Soon with continued practice, this may be the only way you breathe. *Poses can be held anywhere from a few minutes up to 20 minutes. I suggest that you begin with a shorter duration. Allow time for adjusting. Place blanket single-fold on chair draping down. Legs can stretch through chair or straddle or cross-legged. Arms placed folded on chair in front of you. Rest forehead on arms. Tilt chin slightly toward your chest. Close eyes. For comfort or lower back issues, sit on blanket, add rolled up blankets under knees if legs in straddle, or blocks/blankets under knees if cross legged. May add a blanket at sacrum for grounding. Make two stacks of two double or triple fold blankets on top of each other. Placed the two stacks end to end. Height and width of blankets can be adjusted for your body. Sit down straddling one of the stacks and carefully lower yourself down onto forearms, swing your legs on to other stack and lie down. Neck roll is placed at top stack, lower shoulder and head to floor. Neck is supported by neck roll and head is completely flat on floor with forehead and chin on the same plane. Arms stretched out to the sides. The stacks of blankets should be long enough for the entire body to be resting on including the feet. Option to put strap around calves if the legs are rolling outward. Stay for up to 15 minutes. Roll off blankets slowly and bring knees to chest with some movement. 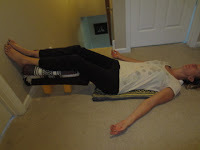 Benefits: relaxes the muscles of the lower back, legs, refreshes the legs, relaxes the muscles and organs of the abdomen. Place a blanket on chair so you don’t feel the hard surface. If you need to elevate the body, you can place a triple fold blanket in front of chair, then place your hips on blanket to one side, swing the legs up onto the seat of the chair as you lower your upper body onto the mat or floor. Use a neck roll to support cervical spine. Place a blanket or sandbag on legs to ground you in the pose. Arms release to the sides with palms turned up. Use an eye pillow to shut out any light for ultimate relaxation. An eye pillow or some type of weighted object (I’ve used stuffed animals) can be placed in open palms to move and free up energy. Stay for up to 10 minutes. Your beginning practice may consist of only 5 minutes. Feel the legs drain, the stress melt away. First thing in the morning, set your intention for the day, to cultivate Metta Karuna – practicing loving kindness to your self and to others. Meditate and reflect on your heart center, acknowledge how it feels. Is it open/closed, receptive/defensive? Repeat the Metta meditation. Journaling allows people to clarify their thoughts and feelings, thereby, gaining valuable self-knowledge. It’s also a good problem solving tool. Journaling about traumatic events helps you process them by fully exploring and releasing the emotions involved and by engaging the hemispheres of the brain in the process, allowing the experience to become fully integrated in one’s mind. The health benefits of journaling have been scientifically proven. Buy a journal. This may seem simple but what kind of journal you purchase is important. Blank pages versus lined pages or perhaps even journaling on your computer. There are many on-line options. Use your book to reflect your creativity or go with function first. Set aside time. One of the most difficult of parts of journaling. It’s important to block off about 20 minutes each day to write. Is it the morning you prefer to start you day or in the evening, to wrap up the day. And maybe the only time you have is during a lunch break. Take whatever time you get. – dreams, possible purpose in life, childhood memories and feelings surrounding them, where you would like to be in two years, best and worst days of your life, if you could have three wishes, what are you grateful for……..
Write about thoughts and feelings. As you write, just don’t vent. Write about your feelings, but also about your thoughts surrounding the emotional events. Relive events, and try to construct solutions and ‘find the lesson’. Keep your journal private. If you are worried that someone else may read it, you may self-censor and you won’t achieve the same benefits from writing. Lock away the book or if using a computer, password protect it. Writing for 20 minutes is ideal but if you have only 5 minutes, use it. Try not to self-censor, let go of ‘shoulds’ and just write what comes. Outline two or three personal goals or intentions for yourself and investigate the deeper purposes for these goals. Ask yourself why for example you may want to lose weight, or quit smoking. Do these goals or intentions feel heartfelt and sincere? Bring these goals or intentions into your yoga practice, say them silently to yourself, write them on little sticky notes, place them on your bathroom mirror, in your purse; wherever you can see them as a gentle reminder. Try meditating on them after doing a restorative pose when the mind is clearer. Write them down in a fruit-scented pen so you will not only want to read them but draw all of the senses to them.